Those not familiar with it, the Mochila is the traditional woven bag indigenous to the women of Columbia, but recently as Cartagena has become such a popular resort destination, more and more fashion lovers are picking them up from the local artisanal vendors and taking them to new destinations. The popularity of these bags is also a great thing for the Wayuu tribeswomen who make them; these women sustain their villages’ economy by hand making these pieces and selling them to local vendors. They are a labour of love. Each bag takes up to 40 hours of work and all designs and colour choices are unique. Many designs come from the Wayuu culture, signifying something special to the creator such as ‘rays of the sun’, ‘wind’, ‘path of love’, or perhaps ‘coming of age’. According to Vogue US, a project that is inspired by the bags themselves was formed. The Mochila Project which it is now known for was a project – conceived and executed in just two months, wherein the traditional handicraft of these handbags was spiced up with the techniques and styles of contemporary fashion designers. Each participating designer was given a traditional bag to be updated and embellished in any way. The results currently on display at the Webster Boutique in Miami, were more visually stunning than anyone imagined. VBH’s signature envelope clutch was complete with exotic crocodile and silver hardware, Phillip Lim’s version tricked out with crystals, whereas Missoni wove theirs in threads of silk and coloured the chain and trimmings. Well known celebrities such as Shakira, Katy Perry, Uma Thurman and even Kourtney Kardashian have been spotted with a traditional Mochila bag. You can also give back to the hard working people of Northern Columbia by supporting a good cause and make a bold fashion statement this summer. See Wayuuu, the biggest wholesaler of original Wayuu Mochila bags worldwide on stand 1014 at Fashion Exposed Sydney, from 16 – 18 August, 2014 at the Sydney Showground, Olympic Park. Visit www.fashionexposed.com.au for more information. 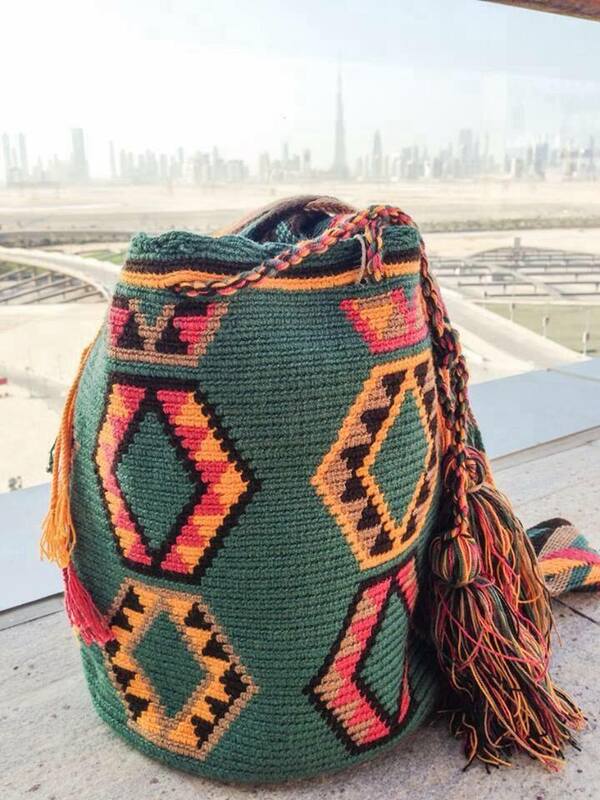 Tags: accessory, bag, bags, bright, Celebrities, Charity, colour, colourful, Columbia, Creation, fashion, fashion exposed, Good Cause, Love, pattern, South America, summer, trend, Vendors, vogue, Wayuu Mochila, Wayuuu, Weave, women, Woven. Bookmark the permalink.